When things get out of hand, we all have different ways of regaining control of our lives. When I am feeling overwhelmed, I organize. I need to make a distinction between organizing and cleaning: I don’t clean, my husband will be the first to tell you that, so to prevent him from posting an unflattering—but entirely true—description of just what a slob I am, I will repeat: I do not clean, I rarely straighten, I tend to be entirely oblivious to clutter. I’m not proud of that fact, but sadly, it’s absolutely true. However, when I am besieged by deadlines and overcome by the sheer volume of tasks and responsibilities facing me, I get busy organizing. Once I have organized my life, I feel like I am back in control and able to tackle all of my obligations steadily and timely—and even enjoy doing them. My first step in organizing is to make a list, or, more accurately, multiple lists. I make lists of everything I need to do and then sub-lists of the various steps to doing them. I make lists of things I need to remember. I make chronological lists, shopping lists, task lists … and when things get truly overwhelming, I make a list of lists I need to make. That is the point I have reached this week. It was in this list-making frenzy that I realized I haven’t made many lists related to kindness. Maybe I hadn’t yet reached the stress-level needed for that. Fortunately, the universe has conspired to remedy that, and kindness has joined the ranks of lists that I employ to organize and bring order to my life. Fear of Rejection – the gift of our kindness might be misunderstood or spurned. Ouch! Fear of Embarrassment – what if I extend kindness clumsily and look foolish? Ouch, again! Fear of Judgment – people will say I’m weak or maybe gullible. More ouch. Better to do nothing than to risk the vulnerability…or is it? Part of the solution to dealing with fear is to focus not on the bad things that might happen but on the good outcomes you are seeking to bring forth. That’s a sure way to banish fear. Laziness and Inertia – While there are certainly kind actions we can take that don’t require a lot of energy (a smile, a compliment, a door held open), many kindnesses do require that we extend ourselves. They require that we get off our butts, go out of our way, and sometimes even leave our comfort zones. Usually it’s just a matter of taking the first step and then our intentions take over and kindness ensues. But the hurdle is that first step and overcoming the inertia to take it. Indifference – The antithesis of kindness, indifference is a barrier to living a kind life. One cannot be kind if caring is absent; one cannot be kind if one is willing to shrug and say, “It’s not my problem.” Indifference may be how we protect ourselves from strong feelings, from the caring that moves us to action. It may be comfortable to wallow in indifference, but kindness requires that we stop being a spectator and jump into life. Entitlement – Sadly, there are many people who see kindness—if they see it at all—as something that can be selective. It’s not as essential to show kindness to the clerk, the cashier, or the homeless person as it is to the VIP who can help one get ahead or feel powerful. There’s an adage that says “a person who is kind to you but rude to the waiter is not a kind person.” It’s so true; selective kindness isn’t kindness, it’s opportunism. Kindness is something we extend to everyone at every opportunity. Obliviousness – It’s easy to miss opportunities to be kind if we aren’t paying attention to what’s going on around us. We may not notice that there is a person behind us for whom we can hold a door, or that someone needs help carrying their groceries, or that a child is frightened or sad. Too often, we allow technology to take precedence over human connection—we are constantly absorbed in our hand-held devices, oblivious to the life around us and the myriad opportunities we have to offer the gift of our kindness. We can even be oblivious to our own need for self-care—unaware that we have depleted our energy and need to engage in some personal renewal if we want to be able to care for others. Paying attention to our lives is easier said than done, but it’s one of the essential elements of a kind life. Habit – If we are in the habit of saying no, it’s hard to say yes—to someone who asks for assistance, for our time, or for a dollar or two to help them make it through the day. Of course, we can’t say yes to everything or everyone, but whichever answer we choose should come out of conscious conviction, rather than robotic routine. Not enough time – It takes time to be kind—to pause and think about what the kind response is, to offer assistance knowing that it might delay us from our tightly-packed schedule, to connect on a human level with the people we encounter throughout the day. It even takes time to be kind to ourselves—an essential quality to being able to extend kindness to others. In the face of so much hurrying, it helps me to remind myself that my number-one job is kindness; all else comes second. Impatience – Impatience might be a subset of feeling one doesn’t have enough time, but it’s more than that. We may have all the time in the world and still be impatient with someone who lacks skill or understanding in something. It’s just easier to roll our eyes and do it ourselves than to extend the kindness—the patience—to teach, or coach, or watch while someone fumbles or stumbles. Offering genuine patience is always a kindness. Fatigue – Research has shown that when we’re over-tired we’re not only more prone to accidents, have difficulty learning, and feel stressed, but we are also more likely to commit unethical or unkind acts. As I’ve gotten older, I’ve come to value sleep more than ever—and knowing that it helps make me kinder just makes my bed even warmer and cozier. Having made a list, I already feel better. No OCD tendencies here. Have I left anything out? 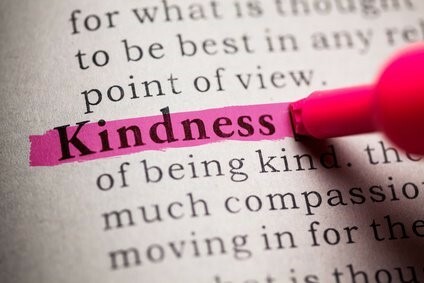 When you miss an opportunity to be kind, can you ascribe it to any of the above, or are there other reasons? This entry was posted in Kindness and tagged acts of kindness, Compassion, Entitlement, Extending Kindness, Fatigue, fear, Impatience, Kindness, Obliviousness, Patience, Paying Attention, Rejecting Kindness, Self-care, Sleep, Unkindness, Vulnerability by Donna Cameron. Bookmark the permalink. Thank you, Anand. Love and light to you, as well. Thanks for reading and for your own thoughtful posts. Your entire post is an elaboration of the opening words of William Penn, on the need for kindness. I heard these meaningful words first time during my undergraduate days in early 1970s, and on several occasions thereafter. We are all here in current transit just once, and loving kindness that we extend, and receive, are the only things that will edify and endure…best wishes. Thank you for your lovely comment. Yes, it’s a lesson we learn and relearn every day. Penn said it so well–like you, I have treasured this quote for decades. Thank you for reading and commenting. My best to you. Thank you, Catherine, for this very thoughtful comment. Yes, I so agree that where we place our attention is what we manifest.